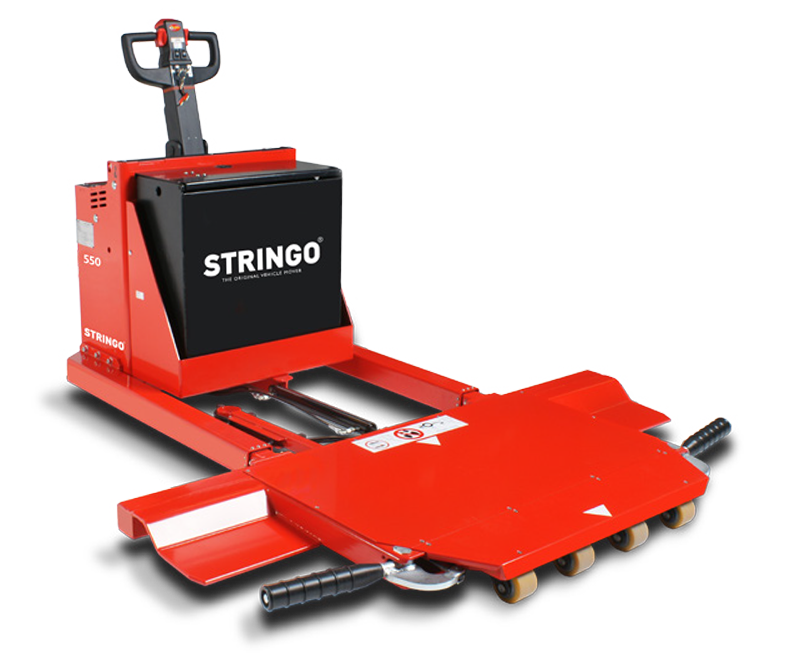 The Stringo 550 is intended for those who need a heavy-duty vehicle mover capable of transporting vehicles weighing up to 5 000 kg. This machine, with its pinpoint accuracy and brilliant handling, enables you to maneuver heavy vehicles in areas where there is limited space. 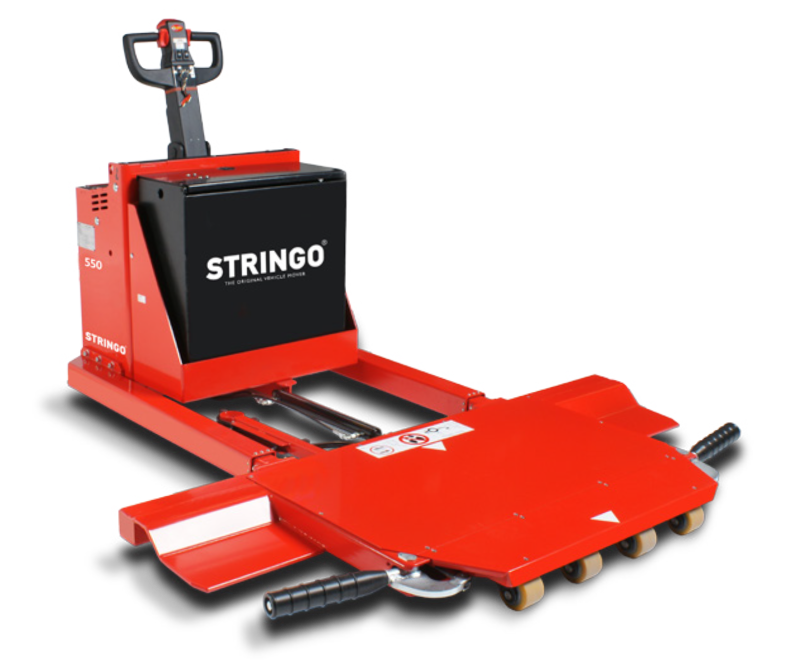 The Stringo 550 is a fantastic aid in professional environments where heavy vehicles need to be moved with care. You will find it being used by the automotive industry on assembly lines for larger cars and smaller trucks, or in the industry’s design departments to move heavy clay models. The Stringo 550 is a model frequently also found in the testing labs of automobile manufacturers. 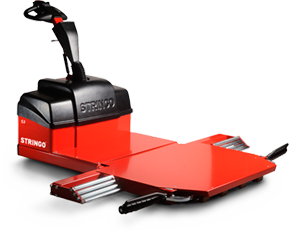 The Stringo 550 is a heavy-duty vehicle mover that delivers a combination of strength, efficiency and flexibility. This model is available with a ride-on platform (Stringo 550 Ride-on) or without (Stringo 550 Pedestrian). In addition to a ride-on platform, Stringo 550 Ride-on also features power steering. The Crash kit add-on option is ideal when you have to move collision-damaged vehicles that have, for example, front-end damage and unusable front wheels. 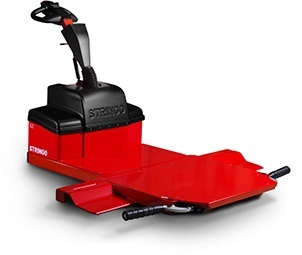 This option adds a remote-controlled winch to the Stringo 550 Ride-on. This enables vehicles weighing up to five tons to be dragged or lifted onto the front section of the vehicle mover, which is reinforced with a crash plate. In addition, there are pressure rollers specially designed to withstand sharp edges.